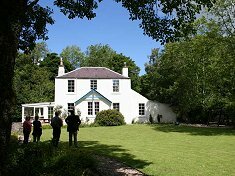 If you’re looking for self-catering with space for large groups or family holidays, you can find a wide range of large holiday homes on EmbraceScotland. Whether it’s for a reunion, walking party or summer gathering, there are large houses all across the country that are ideal for supersized celebrations or relaxing family breaks. Make the most of family time together in a large holiday home – imagine relaxing in your own living space, with all the comforts of home, whilst the children roam extensive grounds. Or enjoy a group holiday in quality assured large self-catering with plenty of space to do your own thing. From luxury homes to spacious lodges, converted churches and mills to cottages on beautiful Scottish estates, you can find a holiday home to suit your holiday needs. Everything you could need under the one roof! So this summer, why not go large in Scotland! Visit EmbraceScotland for more information on large holiday homes.